Rob and I drove the 76 mile, extremely remote dirt road from Big Water to Escalante, Utah in late April, 2011. After a night in the Warm Creek Bay area in Glen Canyon NRA, we continued on our way. The first half of the drive was spectacular with views of Glen Canyon, incredible rock formations, and miles of beautiful Utah and Arizona high desert. 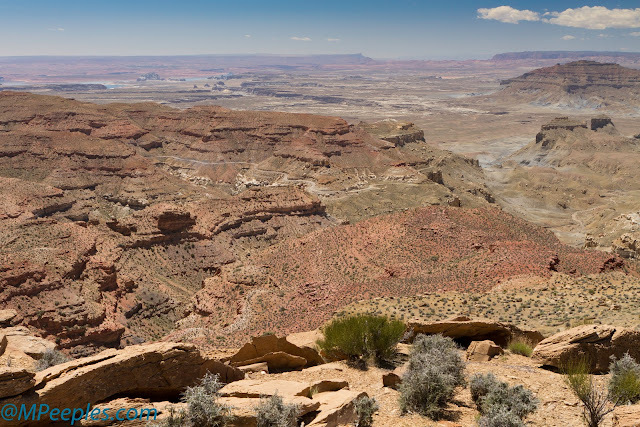 There was some fun 4-wheeling going up Kelly Grade, but once we climbed the Kaiparowits Plateau, our work was really cut out for us; lots of miles to go on a twisty, rutted, and rocky road. We managed to find a suitable camping spot late that afternoon. We noticed some clouds moving in that evening and by 4 am the next morning, it began to rain. It was light at first and faded away, only to return more consistently around 5. Soon after, it was snowing. It was to time get out while the getting was good, if it still was. Utah red dirt roads are notoriously impassible when they get wet. We managed to slip and slide the last 4-5 miles into Escalante and were thrilled when we hit pavement for the first time in 90 miles. We toured Bryce Canyon and Zion, then headed to warm and windy, Death Valley.